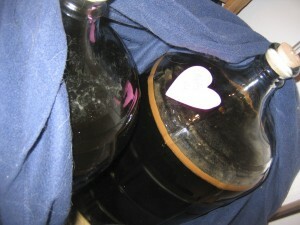 Well it is no longer the holidays and my poor, poor holiday ale is still sitting in the secondary fermentor. I had every intention of giving this beer out at the holidays to my friends and family, but the Devine Fermentors (yeast) were not on my ally this time out. Like most of my brews, this started off great. Smelled amazing, the cinnamon, cloves, and nutmeg. Hit the high end of my target Original Gravity (1.068). After 20 days in the primary and two gravity readings (1.032) way off from the target Final Gravity, but it had been in the primary so long, I figured it was done. Within a couple hours of moving to the secondary fermentor, the fermentation process rapidly started up again. Bubbles were coming out of the air lock every couple of minutes. After 5 days of this I had a nice inch thick Krausen layer. It has now been 4-5 weeks in the secondary and every thing looks great now, except for the ring left on the side of the glass where the Krausen Layer stuck to the glass. I hope to bottle this over the next week, maybe keep it for next thanksgiving. The moral to this story if you haven’t hit the final gravity, you’re not done. For my case all I really needed to do was give the primary a good agitation to kick start the fermentation.